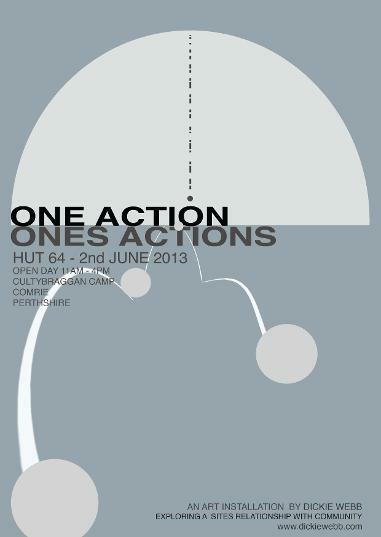 One Action, Ones Actions is a new work by Edinburgh based artist Dickie Webb. The interactive sculpture, installed within the Cultybraggan Camp near Comrie, Perthshire responds to the sites history and seeks to visualise the ongoing relationship to the nearby community of Comrie. On the 2nd of June 2,000 bouncy balls will fall from the centre of Hut 64, an A listed Nissen Hut first used to house Prisoners of War in WWII. The 2,000 represents the local population, individuals which form a community. The movement of the bouncing balls through the space highlights their individual journeys. These objects interact with mobile structures and stationary balls present within the confines of Hut 64. The individual balls start to operate as a whole rather than isolated entity as more of them enter the space. It is this interplay of time and motion of objects that One Action, Ones Actions explores. An unknown performance choreographed by chance and prior actions.